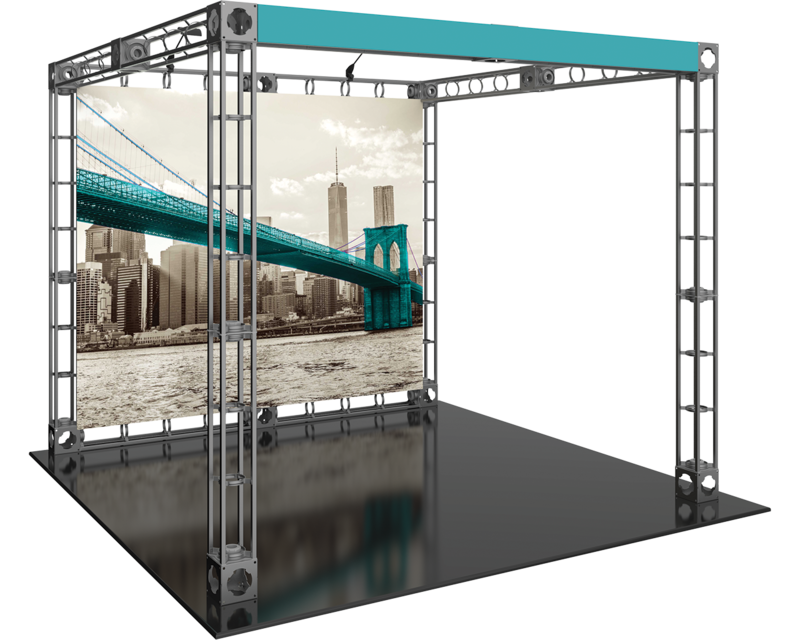 Classic construction and industrial styling have made the Orbital Truss system an iconic contender in the 10 x 10 trade show display market for years. Dominate the show floor with the bold, industrial look of the tool­less Orbital Express System. The Helios 10x10 trade show booth display features a stand-out header and three LED lights. Available for customization. Dominate the show floor with the bold, industrial look of the tool­less Orbital Express System. 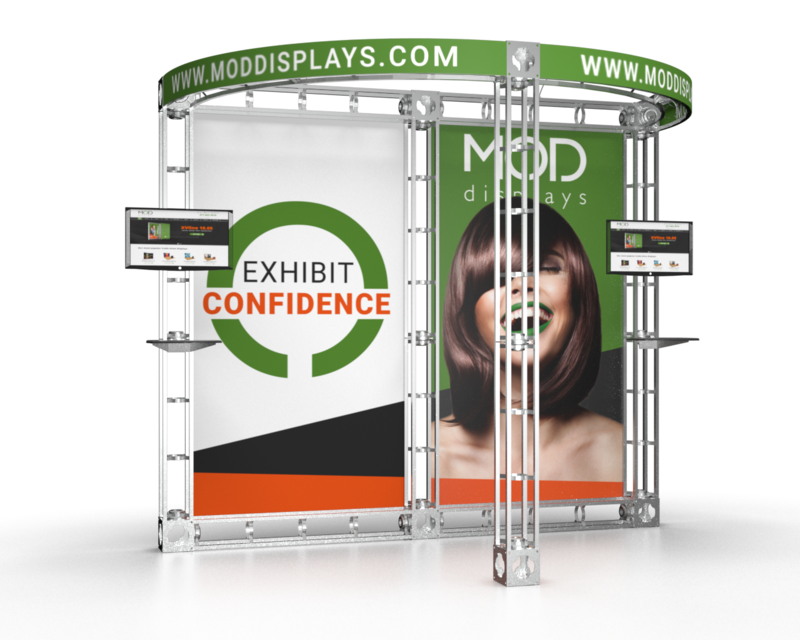 This 10x10 trade show booth display features three counter shelves, a curved backwall and four LED lights. Dominate the trade show floor with the bold, industrial look of the tool­less Orbital Express System. 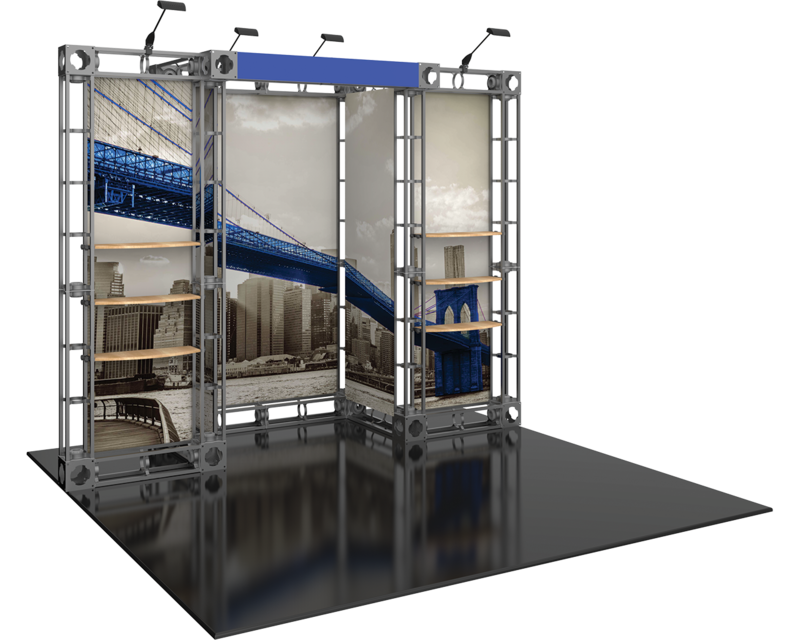 The Eros 10x10 trade show booth display features built-in product shelving system, and recessed center space with four LED lights. Dominate the show floor with the bold, industrial look of the tool­less Orbital Express System. 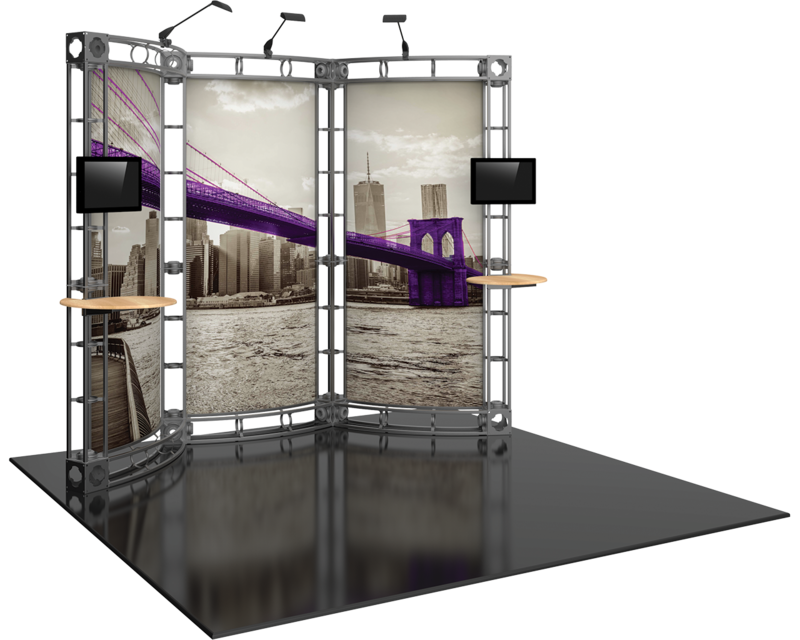 The Metis 10x10 trade show booth display features a media-ready monitor mount, counter, three LED lights, curved backwall with low sidewalls. Additional customization available. 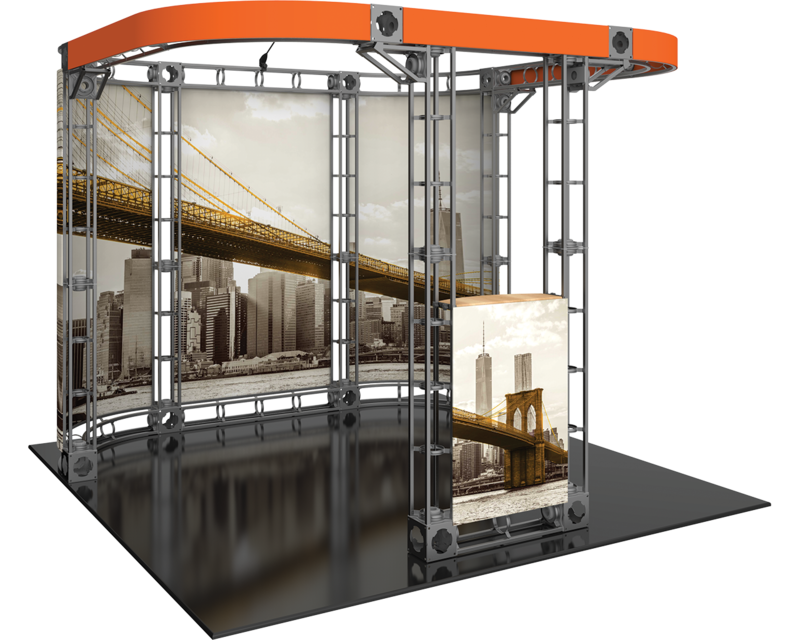 Dominate the trade show floor with the bold, industrial look of the tool­less Orbital Express System. 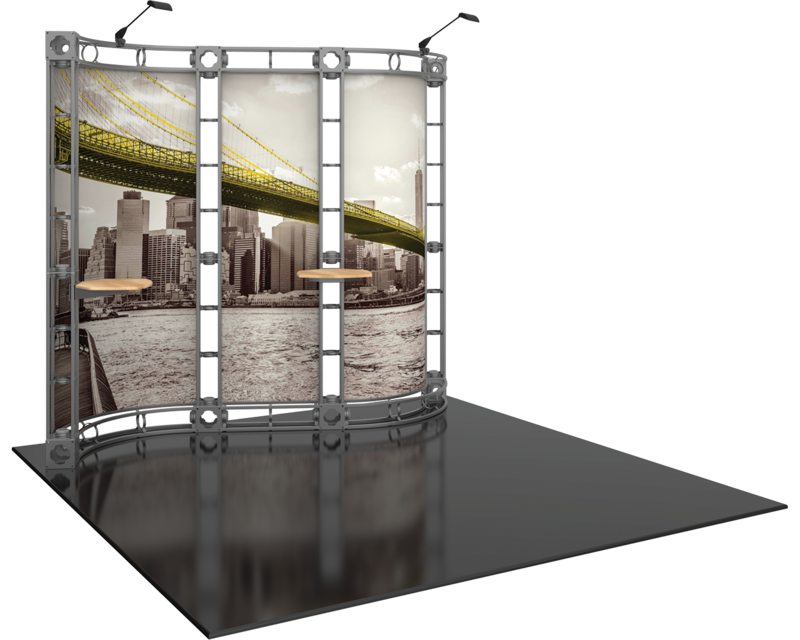 The Lyra-2 10x10 trade show booth display is ideal for a corner or inline configuration and features two counters, three LED lights, and a bold header. Additional customization available. Dominate the trade show floor with the bold, industrial look of the tool­less Orbital Express System. 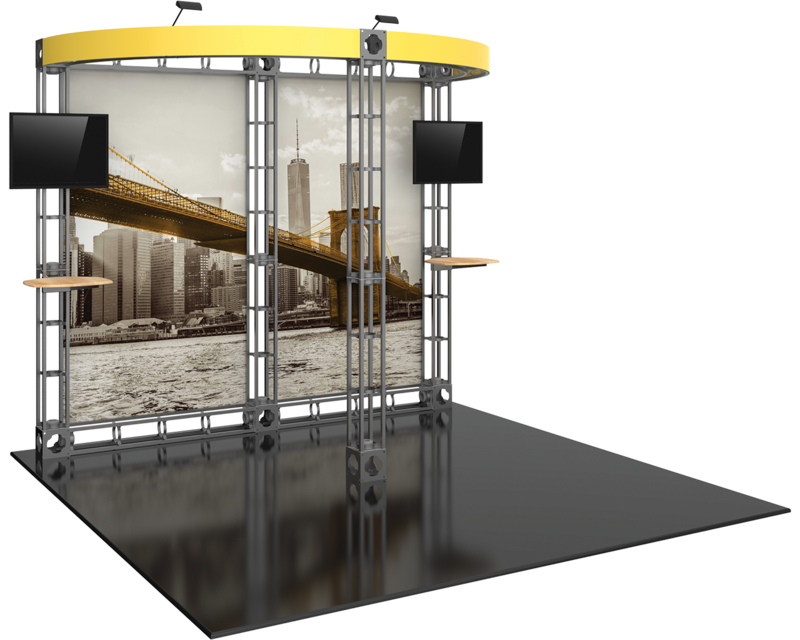 The Clio 10x10 trade show booth display features two media-ready monitor mounts, two counters, two LED lights, and a wide header graphic. Additional customization available. Dominate the show floor with the bold, industrial look of the tool­less Orbital Express System. 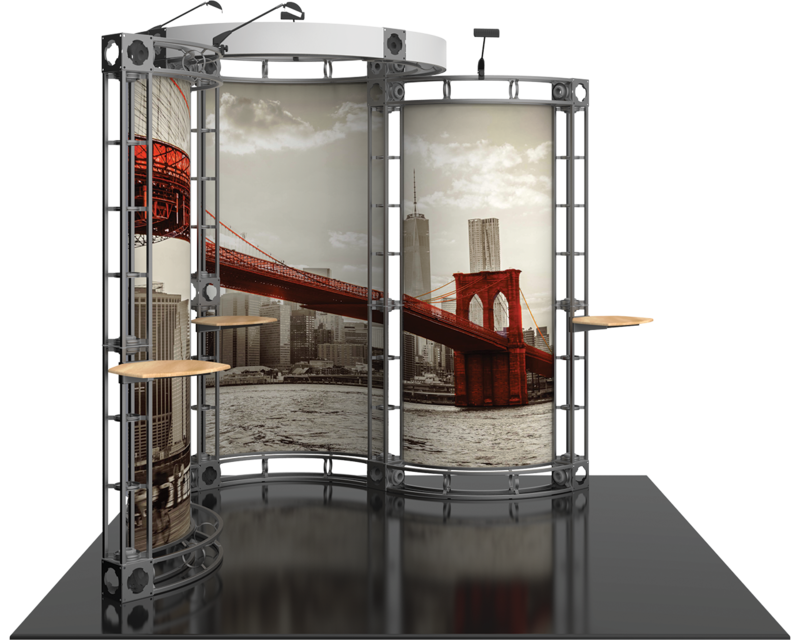 The Luna-1 10x10 trade show booth display features four horizontals, two LED lights and header graphic. Additional customization available. Dominate the show floor with the bold, industrial look of the tool­less Orbital Express System. 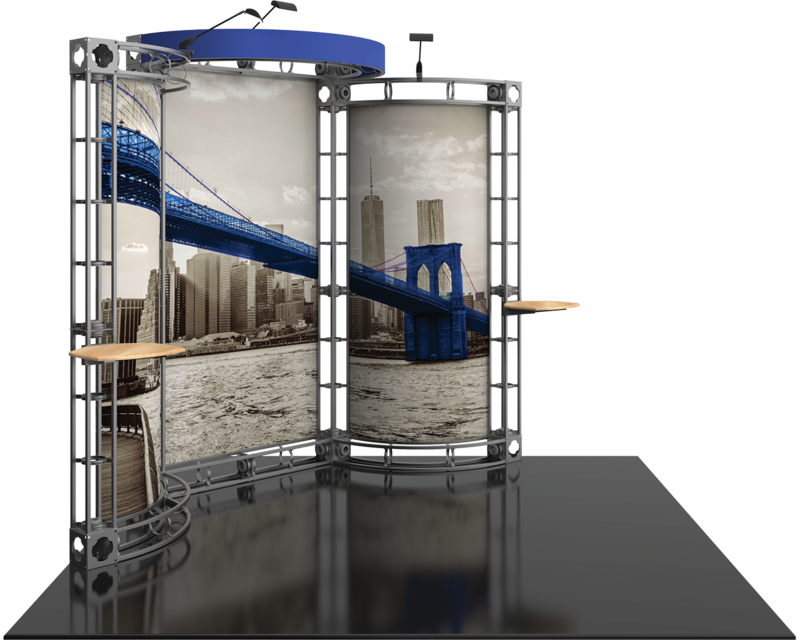 The Sirius 10x10 trade show booth display is ideal for corner or inline booths, and features two counters, 3 LED lights, and a small footprint for versatility. Additional configurations available. Dominate the trade show floor with the bold, industrial look of the tool­less Orbital Express System. 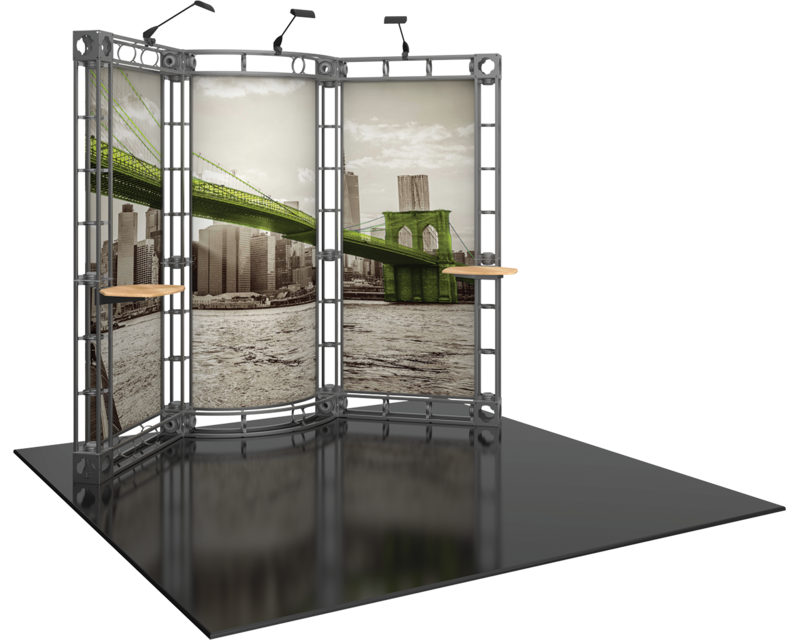 The Mercury 10x10 trade show booth display features a serpentine backwall, 2 counters, 2 LED lights, and a slim profile ideal for versatile placement. Additional configurations available. Dominate the show floor with the bold, industrial look of the tool­less Orbital Express System. 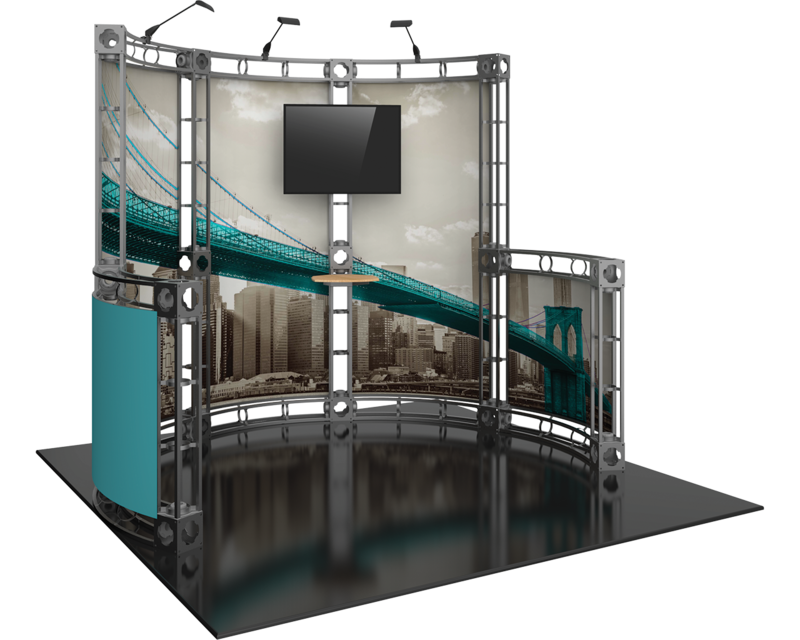 The Lynx 10x10 trade show booth display features two media-ready monitor mounts, two counters, 3 LED lights, and a small footprint for versatility. Additional configurations available. Industrial styling makes this an ideal choice for certain types of businesses. The frame goes together like an Erector Set using twist-and-lock connectors to piece together the steel truss sections that can be customized into an endless amount of configurations. Pre-designed kits provide options in a variety of booth features. Multiple custom-printed panels and headers allow for personally branded displays. Many accessory add-ons such as shelves, literature racks, monitor mounts, extra lighting, and more. Highly scaleable.